christmas is just right about the corner, yet, despite all the airy merriment and fancy decorations, the feeling of christmas ain't quite around. in all the morosity of good old gloom and doom, one would be lucky to even find a pinch of gaiety. monica forsberg once wrote, in swedish that is, "det är dags att tända alla ljusen"; meaning "it is time to light all the candles". thank murphy for having this brilliant way of doing things. if good things like to come in pairs, bad news certainly love to come in the form of a bloody recurring avalaunche. 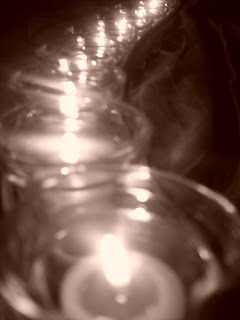 guess in times as such, all the more so and aptly put that, indeed, "it is time to light all the candles".